I suppose if it works - you keep doing it! 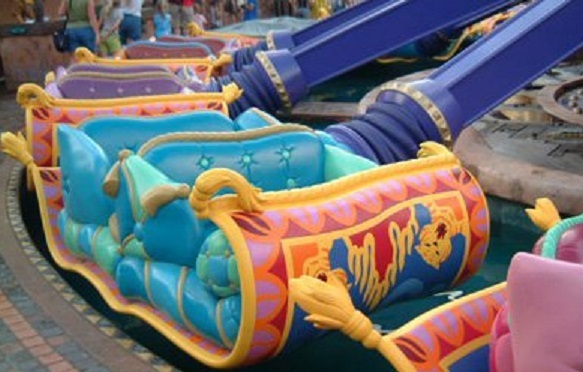 You'll never see an empty queue at the Dumbo ride; even now that they have two of them at the Magic Kingdom... so why not a third? 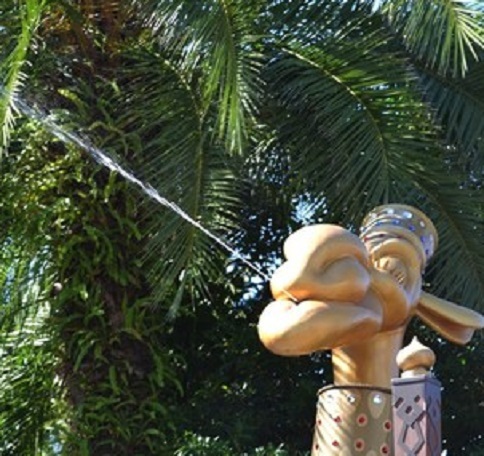 Apparently, when they decided it was time to bring Aladdin to the park, a Dumbo-imitation seemed appealing (or more likely the quick, easy option). Welcome to The Magic Carpets of Aladdin, as of May, 2001! So... if you replace the elephants with "magic carpets" and trade in the Timothy Mouse centerpiece for a Genie lamp, Dumbo becomes the Aladdin attraction. Well, I suppose that may be a rather simplistic view, but it's essentially the same ol' hub-n-spoke midway ride that's fun for about two of the 90 seconds that you spend on it. 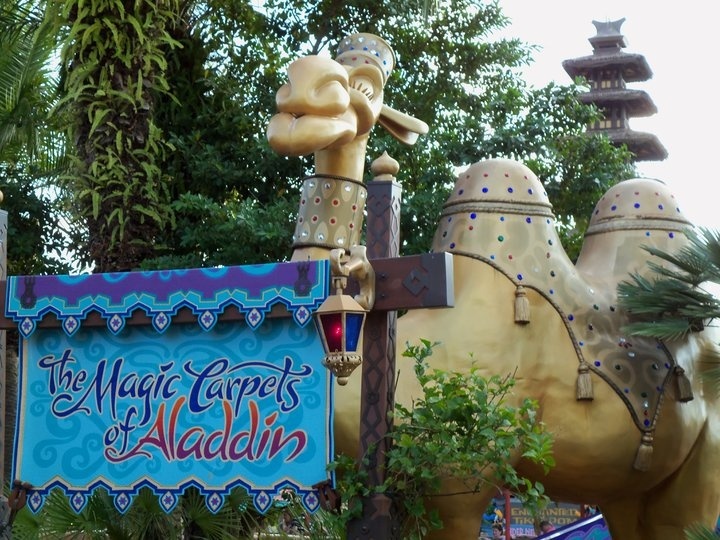 The highlights of the Magic Carpets... each of the 16 carpet vehicles carry four passengers (still a slow loader, but better than one Dumbo! ), and riders work together to control the carpet's movement. That's right - front seat guests control the varying height of their carpet during their "journey"; back seaters control the tilt, or pitch of the vehicle. Let's just hope your party can coordinate that one without pitching yourselves overboard! Okay... so that can't actually happen, but it would liven things up a bit here, eh? One silly little touch does make me appreciate this little bottleneck causing attraction - the spitting camel! Yep, you read that right - pay attention as you wander the area around the Carpets. You just may get a camel-powered bath if you're not careful. It's always fun to watch the newbies get a surprise sprinkle. I may be just a little sinister like that, but I once fell victim unknowingly too, and I don't begrudge those who chuckled at my shriek. After your carpet ride, do take a moment to stroll the area. The shops here are some of the more unique and interesting at the Magic Kingdom. This area is set up to look much like the marketplace of Agrabah in the Aladdin films, and it's a fun nook to explore. Keep your eyes peeled, as Jasmine, Aladdin and even Genie are known to make appearances here!